2010 is almost a memory and we are looking forward to 2011 -- and on this last day of 2010, I want to share memorable moments at Linderhof this year. 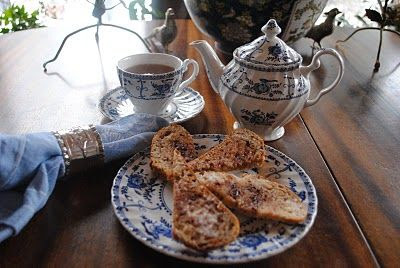 We always stop at half past three for a pot of tea and a nosh -- in January, it was cinnamon toast -- a favorite as a child and a favorite as an adult! 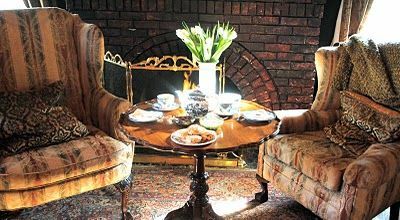 An English cream team in front of a February fire -- real clotted cream and scones and a pot of Earl Grey -- a perfect way to spend an afternoon! With a green teapot full of tea, an English tea set that's green and white, we celebrate St. Patrick's Day with a Chocolate Guinness Cake. A full afternoon tea at Linderhof complete with sandwiches, scones and sweets. Served on the Spode Famille Rose. 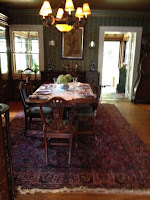 We've had yellow bell luncheons, paperwhite luncheons and lavender teas . 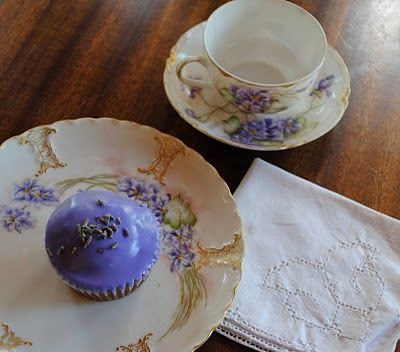 . . but what better way to celebrate May than with a violet tea -- handpainted violet tea plate and saucer and a lavender cupcake frosted with violet frosting! 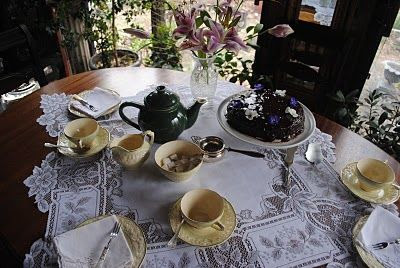 Sometimes it's just a friend who comes over -- a cup of tea and a nosh -- what better cake for a nosh than chocolate! I've healed well from surgery and nice of a friend to stop by for tea . 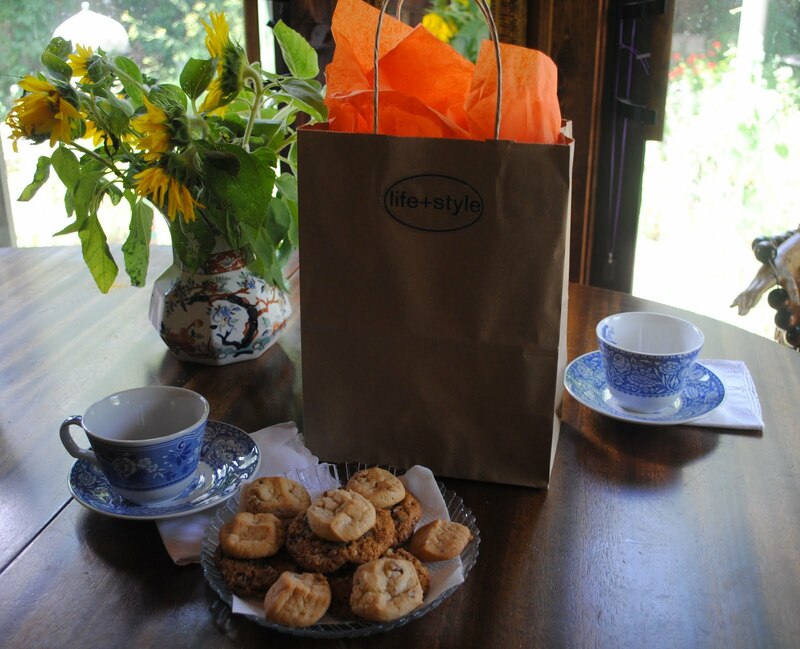 . . and bring tea treats as well as a wonderful gift!!! Friends are special! 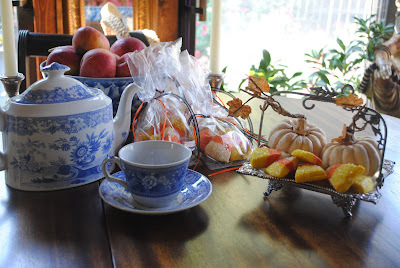 A tray is perfect to set the plate of orange sugar cookies, tea pot and teacup on to carry to the breakfast room for half past three tea. 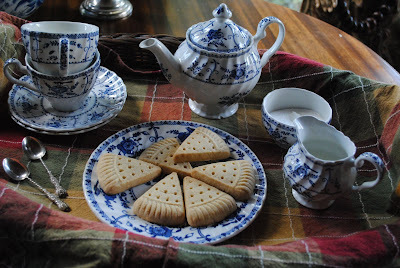 Even with another surgery, I can still manage a simple tea tray when a friend comes to visit -- the nosh -- boughten shortbread! I love making cookies as holiday gift for friends -- whether the holiday is Valentine's, Halloween or Christmas! 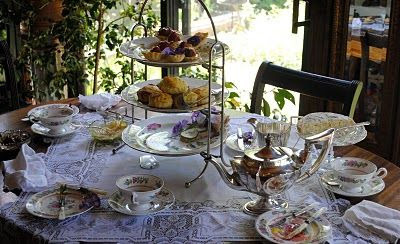 And, of course, there is the benefit of a few left for my afternoon tea nosh! 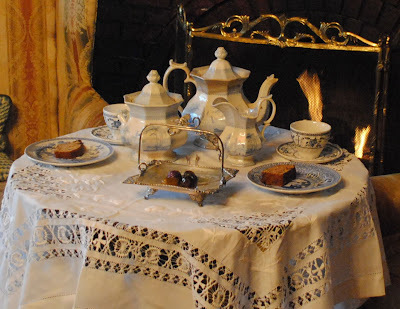 Cass, from That Old House, managed to come to Linderhof for tea -- I served tea in the best parlor for Cass (and Cavalier Dion) are special friends. 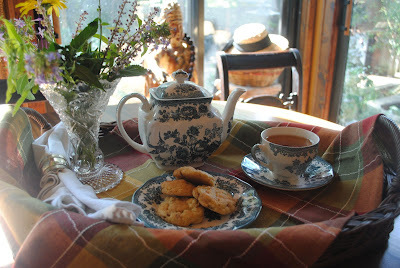 It was only a cyber tea, alas, but we both had fun! 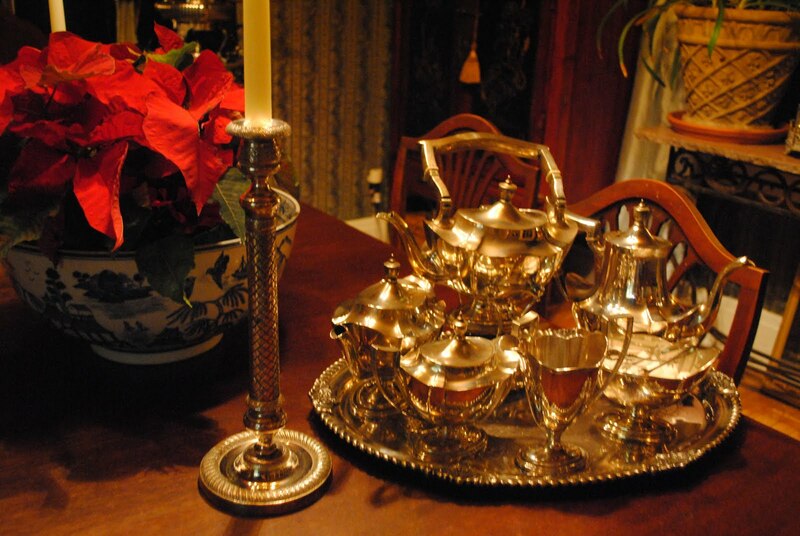 The silver is gleaming all during December because any and all teas in that month are special! We enjoy your visits to Linderhof. 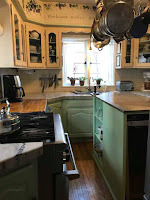 We enjoy having company whether it is a friend or neighbor that we can share a pot of tea with or 6 or 8 for dinner or the house filled with friends for a cocktail party. 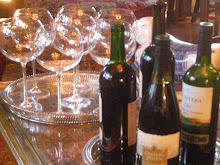 Here's hoping that you and yours will have a Happy New Year and a bountiful 2011!!!! Here is hoping you have a Happy New Year, Martha. I have enjoyed all your posts this year, especially the recipes. Your teas are always wonderful. I love seeing them all. 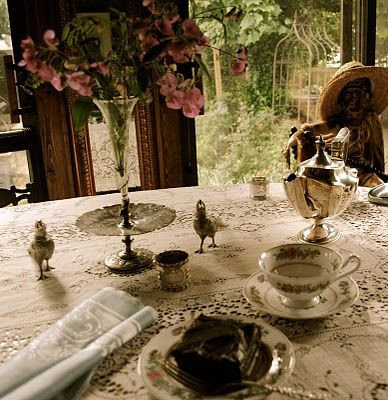 You manage to set such a beautiful tea tray no matter the day or occassion. I am always inspired. What a lovely post. I loved seeing all your tea sets and know those who have recieved an invitation have been warmly recieved! Thank you for your continued inspirations. 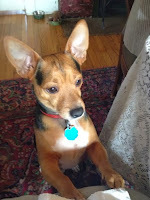 Looking forward to blogging with you in 2011! 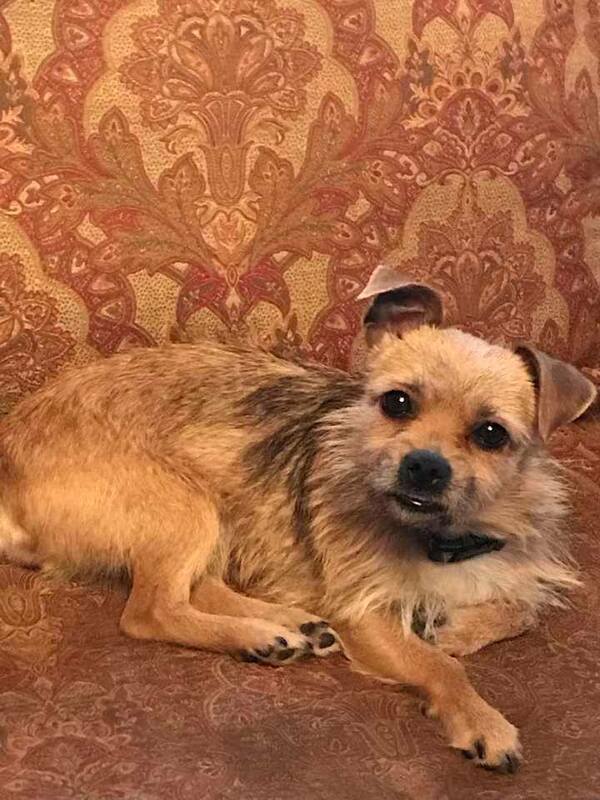 What a great year it was, Martha...all that and surgery - you are a star! I've enjoyed every sip, every bite and every minute at LInderhof. Martha....what a nice post. I enjoyed reading your posts through the year. Wishing you a "Happy New" !!! Happy New Year, Martha. I hope the coming year brings you health and happiness. Your retrospective is lovely.